My name is Gloria Hodge and I have been in the education and early learning field for nearly 16 years. My experience includes work in South Korea, Southern California and Washington. I also volunteer for Renton School District in various capacities. During my free time, I love spending time with family, watching movies, and traveling. I am excited to be part of Hoa Mai as the center will provide children the opportunity to learn in both English and Vietnamese while preparing for kindergarten. I am also thrilled for the Vietnamese community as Hoa Mai will be the first Vietnamese-English bilingual preschool in Washington State. We are setting a model for others to follow! Hoa Mai’s dual language program is the first step in preparing our children for a multilingual, multicultural world. Being bilingual provides an individual with so many added benefits, both professional and personal. In today’s global economy, a bilingual person truly can gain easier access to clients by being able to communicate in a different language other than just English. I believe the quality of the classroom environment activities, both indoors and outdoors, are essential components in early learning education. I am passionate about ensuring an optimal learning environment for children at the center. What I enjoy most when working with children is being able to engage in classroom activities and see children reach their goals. I also feel caring adults play a crucial role in helping children develop and dedicated volunteers have so much to offer. I look forward to working with Hoa Mai parents and community to build a solid support foundation for our children. My name is Thuy Nguyen. I was born and raised in Vietnam and in October 2016, I relocated to Seattle. I have previously worked in the Environmental Health and Safety field for the past 10 years. I have both a bachelors and masters degrees in this field. Through this prior work, I have gained experience in community outreach, public relations, and administration. These skills are of great help in my job as an administrator at Hoa Mai. I have a passion to help people, especially children, to improve their development and health. Hoa Mai is a great place that allows me to fulfill my passion. When I have free time, I love traveling, reading books and doing outdoor activities such as biking, hiking and kayaking. I also love to start my day here at Hoa Mai visiting and communicating with our super cute and smart children! Hi! my name is My Nguyen and I am from Vietnam. I graduated from college and I was a teacher at a preschool for almost 3 years in my country. I love to work with children and that’s why I began to study Early Childhood Education. I was a volunteer at Denise Louise, in Chinatown for almost two months and that was the first time I worked with children in the US. I feel really excited and happy when I work with children because I feel they are my family. I am a student in Seattle Central College now and this quarter is my second quarter in college. At the school, I study a lot about children, how we can understand them, and how we can help them to develop. Hoa Mai is a great preschool because here, I can have a chance to work with children. I like to use my knowledge and share my experiences towards my goals. I can speak Vietnamese and English and it is always a place to support each other with a dual language program. It is important for me to share my culture with everyone. Hi my name is Mary Hendrix. I will be the Toddler Teacher at Hoa Mai. I have been in the Early Childhood Education field for 28 years. I worked at Zion Preparatory Academy for 23 years. I have taught all preschool grade levels from toddlers to Pre-K. I am a mother of six children and grandmother of two. Four of my children are grown and the two youngest are in middle school. I have my AAS in Early Childhood Education/Para educator from Shoreline Community College. I received my degree in 2008. I am hoping to start on my BA from North Seattle Community College winter quarter. I am looking forward to working with the staff at Hoa Mai, the children and the families. Hello, my name is Kieu Vu. I graduated from Hue Teaching University in Vietnam in 1997 and have experience teaching language for high school students. I received an AA degree in Early Childhood Education and I am currently working toward my BA. 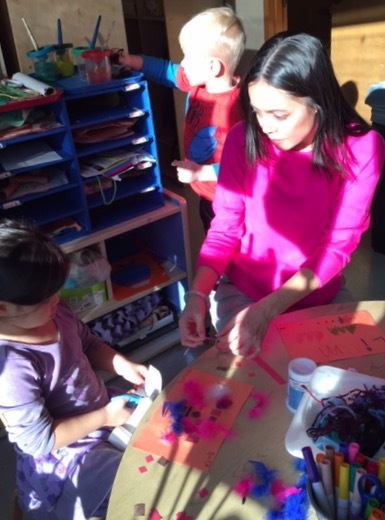 I have been working in the Early Childhood Education field for 8 years, with 2 years spent volunteering as an assistant with preschoolers and a Parent/Leader group in Seattle. I believe that children grow, think, learn, and behave in their own ways, and culture is present throughout a child’s development process. Teachers need to appreciate children’s cultural diversity and their learning styles to make every child feel welcome and confident with the classroom learning environment. Children gain a significant amount of cognitive, physical, and emotional change over their childhood. Therefore, as the teacher I need to have plenty of knowledge regarding child development in order to provide appropriate opportunities and materials that stimulate children’s physical growth and achievement of their learning goals. Working with kids with love and respect is the key for success within my job. I am so excited to join Hoa Mai Vietnamese Bilingual Preschool where I am bringing my knowledge, experiences, and passion to support and scaffold children’s learning through play, as well as providing a productive classroom environment. I am looking forward to building strong teamwork with teachers and parents in order to make Hoa Mai successful as a supportive community and as a Vietnamese Bilingual program. My name is Yolanda Allen and I’m from Texas. I have worked in the education field for almost 20 years in Seattle at Zion Preparatory Academy School. During my career, I have taught kindergarten through second grade. I have also worked with preschool-aged children. I have a C.D.A, I am continuing working towards another degree in early childhood education. I have a son, Robert, who graduated from the University of Washington. He worked in art administration and education here in Seattle. In my free time, I enjoy reading, watching movies and sports, and spending time with my family. I look forward to working with Hoa Mai families and the teachers. I hope to make the most positive impact on the lives of the children and their families. Xin Chao, My name is Iz zah and I am currently a college student at Seatte Central College. I was born and raised in Vietnam, where I was studying to be a teacher. After moving to the states two years ago, I continued on with my studies and dreams in becoming a teacher. I am actively involved in my community and recently had the opportunity to volunteer as a student teacher at Bailey Gatzert Elementary. I am blessed and excited to be part of Hoa Mai Vietnamese Bilingual Preschool family as the new assistant teacher. I hope that my experiences can contribute to Hoa Mai’s mission and values. Hola! My name is Betty Baltazar. I was born and raised in Guatemala. I graduated with a Bachelor Degree in preschool education in Cristo Rey, Guatemala. I taught for 12 years in my country before moving to the United States. I was a volunteer at Denise Louie, Neighborhood House Preschools, Hawthorne and Van Asselt Elementary Schools. I decided to continue my education at the Seattle Job Training & Education Center where I finished my Childcare Basics Training this year. I am very excited to join the staff, children and their families at Hoa Mai! I like to interact with children which includes playing, dancing, singing and reading. I am the mother of three children and I speak Spanish. In my free time, I enjoy spending time with my family. Hello! My name is CamTu Lieu, I’m from Vietnam I came to the United States with my family. I graduated from Evergreen High School and studied some at Highline Community College, I hope one day I can continue where I have left. Now I’m a mom with two little boys that attend Hoa Mai. I have also volunteered with children at church. I like to work with children, I feel comfortable to play with them. I’m excited to work at Hoa Mai! Hi! My name is Duy Nguyen. I’ve graduated from University of Tourism in Vietnam. My favorite hobby is to travel and enjoy all of the best cuisines around the world. I have had the opportunity to travel to many countries throughout Asia, and had a chance to teach in Japan a long period of time. I love learning new languages. Currently, I can speak Vietnamese, Japanese, Mandarin, and English. I’m also taking classes at Seattle Community College to improve my English. I am really excited to join Hoa Mai families and I take pride in my job as an educator. I will try my best to share my experience and knowledge of the Asian’s culture as a whole and Vietnam’s culture in particular. I believe language is an important key when it comes to learning about the culture of a place and I want to provide that opportunity for the children.